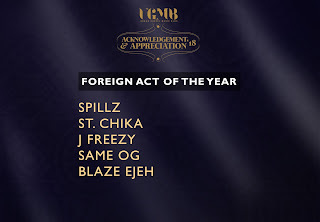 Nigerian gospel singer St. Chika who came to limelight following his hit single Higher has been nominated for UGMB 2018 Foreign Act of the Year. Other nominees include gospel rapper Same OG, Spillz, J Freezy and Blaze Ejeh. Last year with less than three months on the gospel music scene, St. Chika was also nominated for four different categories at The Exousia Gospel Music Awards, one of which included the "Artiste of the Year"